The Arizona Coyotes‘ playoff hopes may rest on being able to salvage one win in their own back-to-back set Sunday. The Islanders snapped a two-game losing streak Saturday by beating the host Philadelphia Flyers 4-2. The visiting Coyotes’ untimely losing streak hit four games Saturday with a 2-1 shootout defeat to the New Jersey Devils. The loss ensured the Coyotes (36-32-7) would fall out of a wild card spot in the Western Conference. 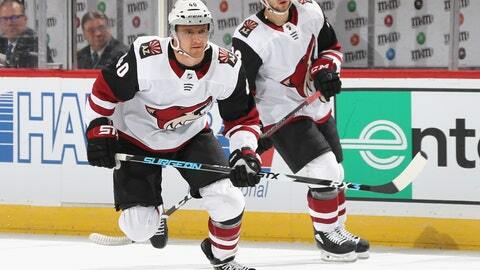 Arizona, which began the day tied with the Minnesota Wild for the final spot but on the outside looking in due to having two fewer regulation/overtime wins than the Wild, fell one point behind the Colorado Avalanche, who moved into eighth place with a 4-2 win over the Chicago Blackhawks. The damage for the Coyotes was mitigated somewhat later Saturday, when the Wild fell to the Carolina Hurricanes 5-1. That results means Arizona can move back into sole possession of the last wild card spot with a win over the Islanders on Sunday plus a regulation loss for the Avalanche, who again take on the Blackhawks, this time in Chicago, on Sunday night. The Islanders (43-25-7) were able to exhale a bit after Josh Bailey scored twice in the final four minutes against the Flyers. New York entered Saturday having lost to the Boston Bruins and Montreal Canadiens by a combined 9-0. Saturday’s win pulled the Islanders within one point of the first-place Washington Capitals in the Metropolitan Division. The win also ensured that New York would retain second place via the tiebreaker over the Pittsburgh Penguins, who earned a 3-2 win over the Dallas Stars later Saturday. Both teams have 93 points, but New York has played one fewer game. “Getting in a little bit of a stretch like this, everyone tightened up a little bit and tried to do a little bit too much,” Islanders goalie Robin Lehner said after he earned the win Saturday by recording 22 saves. “Kinda (lost) the fun out of the game a little bit. I think today we just had a mindset go play our game, have fun again, enjoy the game, not grip the sticks too hard or anything. And I think we came out and we played good hockey,” Lehner said. The Islanders could know by faceoff Sunday at 3 p.m. whether they’ll be playing for a share of first place or sole possession of first in the Metropolitan Division. The Capitals are scheduled to host the Flyers at 12:30 Sunday, while the Penguins are idle.